Why Should You Choose nAb? 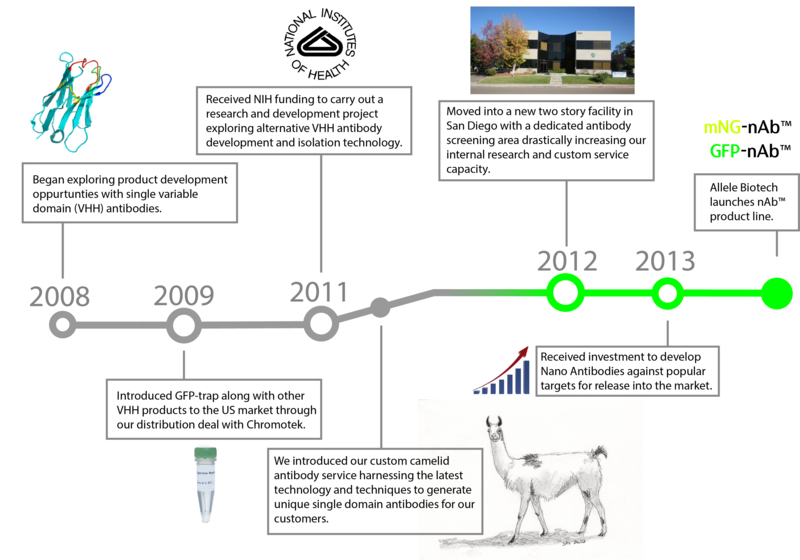 We apply our unique screening process and protein engineering throughout the development of each nAb to generate single-domain antibodies enhanced from natural camelid antibody fragments. As part of our engineering process, all points of linkage between nAb and our optimized affinity resins strategically confine to non-binding surfaces of the antibody, increasing specific affinity while reducing the potential for non-specific interactions. To request a nAb sample Click Here to fill out our sample request form. Polyacrylamide resin - Durable, reusable, FPLC-compatible resin with a high flow rate. Complete Pulldown using the GFP-nAb™ Spin Kit. EGFP-expressing Sf9 (insect) cell lysate contained a total of 16µg of EGFP in total volume of 500µl, determined spectrophotometrically. Following the GFP-nAb™ Spin Kit binding and wash protocols, the protein was eluted in 2 x 50 µl elution buffer (0.2M glycine pH 2.5), pooled, and neutralized with 10µl of 1M Tris base. Equal volumes of lysate input (I), flow-through (FT) after binding to GFP-nAb™ agarose resin, and elution (E) fractions were analyzed by SDS-PAGE followed by Coomassie staining. In this experiment, EGFP was quantitatively removed from the lysate. Allele's involvement in the field of VHH antibodies goes back a number of years to 2008, when we first began to examine and appreciate the unmatched potential of nanoantibodies. In 2009, we introduced GFP-trap along with other VHH products to the US market through our distribution deal with Chromotek. Moving forward to 2011, we received NIH funding to carry out a research and development project exploring alternative VHH antibody development and isolation technology. Shortly after, we introduced our custom camelid antibody service, harnessing the latest technology and techniques to generate unique single domain antibodies for our customers. In 2012, we moved into a new, two-story facility in San Diego with a dedicated antibody screening area, drastically increasing our internal research and custom service capacity. In anticipation of the expiration of a fundamental patent on single chain antibodies, we received investment earlier this year (2013) from Dr. Eric Xu, co-founder of Baidu and owner of the venture group Yifang. With these funds we have kicked off an ongoing effort to generate hundreds of nano-antibodies under the nAb trademark. Our first nAb products will be mNeonGreen-nAb™, mWasabi-nAb™ and GFP-nAb™, with many more to follow. We believe nAb is the clear choice for a number of applications and assays, but how can you integrate nAb into your protocol? Below we have listed a few application protocols encorporating nAbs, they can serve as a starting point or a guideline to carry out various procedures.